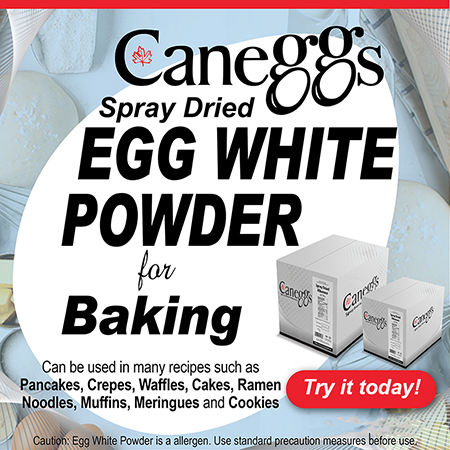 Egg White Powder is made by spray-drying liquid egg whites, AKA albumen. The egg whites are first pasteurized to remove bacteria, after which high tech processors spray tiny droplets of the liquid egg white into a stream of hot air. The result: pure concentrated egg white powder. Our product is high in protein, and vitamins A, B, and D, as well as a variety of essential minerals. It is very low in carbohydrates, fat, and cholesterol, and contains no lactose. There are two basic ways to use egg white powder: rehydrated, and in its powdered form. It’s generally easier to hydrate the egg white powder in water first, but some prefer to use the powder straight in order to create a more concentrated flavor. To rehydrate our Powdered egg whites, combine 4 tsp of egg white powder with 4 tbsps warm water to create roughly 2 oz of liquid egg whites, equivalent to that of 2 large shell eggs. Stir gently and patiently as mixing or blending too vigorously will cause the egg white to foam. Powdered egg whites are often used to stabilize foams such as whipped cream, meringue and mousse. They can also be used to give texture to baked goods. When used for foams, make sure to hydrate in room-temperature or warm liquid and then whip as needed. Powered egg whites can be used in a variety of recipes, including high protein pancakes, crepes, waffles, cakes, breads, muffins, meringues, and cookies! Reconstituted egg white powder is much like the regular eggs you are already accustomed to using. Indeed, once rehydrated (see above for rehydration method), it shares the same texture, taste and properties as liquid egg whites! Bonus: if a recipe only calls for egg whites, you won’t waste any egg yolks. And you also won’t waste any time waiting for your whites to reach room temperature. Powdered egg whites are an excellent approach to your favourite egg dishes, such as omelettes and scrambled eggs. Once rehydrated (see above for rehydration method), it shares the same texture, taste and properties as liquid egg whites, and is an invaluable ingredient in any outdoor or travel cooking you plan to do as it’s so easy to transport!